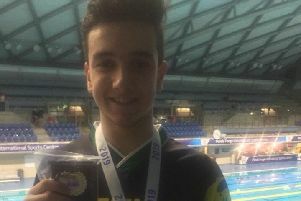 City of Sheffield’s Max Litchfield booked his place at the World Championships in Budapest later this year as he struck double gold in the British Championships at Ponds Forge. The Rio 2016 Olympic finalist broke the British record in the men’s 400m individual medley on day three, breaking away from the pack early on in the race, and in the breaststroke and freestyle legs he left the field in his wake. He touched in an impressive 4:10.63 to book his place at the World Championships in Budapest later this year. “I’m very excited [for Budapest] I wasn’t lucky enough to go two year’s ago, and that was gutting for me, but it spurred me on to come back stronger for the next year. His second title came with with victory in 200m Individual Medley, beating Scottish rival Mark Szaranek to the wall. He touched in 1:58.10, while Szaranek of Edinburgh took silver with a time of 1:58.39. Litchfield commented: “I am very happy. I was hoping to go under the two minute mark, and to break that by a couple of seconds is very promising. Litchfield’s brother, Joe, also made his way onto the podium. He battled with Nathan Hughes of Loughborough Uni down the final 50m, and managed to maintain his pace to touch in 4:20.89 for bronze. And their City of Sheffield team mate Eleanor Faulkner took bronze (4:07.62) in the the 400m freestyle. Stockport Metro’s Holly Hibbott took gold, despite trailing both silver medalist Jazz Carlin and Faulkner at the 300m mark. * British team for the World Championships: Adam Peaty, Jocelyn Ulyett, Max Litchfield, Duncan Scott, Ben Proud, Hannah Miley, Chris Walker-Hebborn, James Guy, Calum Jarvis, Nick Grainger, Ross Murdoch, Molly Renshaw, Daniel Jervis, Charlotte Atkinson, Georgia Davies, Sarah Vasey, Alys Thomas, Freya Anderson, Stephen Milne, James Wilby, Aimee Willmott, Holly Hibbott, Siobhan-Marie O’Connor, Jazz Carlin, Abbie Wood, Rosie Rudin, Mark Szaranek, Luke Greenbank, Kathleen Dawson.